We use a huge number of referees at Nørhalne Cup. We play nearly 1800 games, and some of these games require 3 referees, so we need as many referees as we can get. 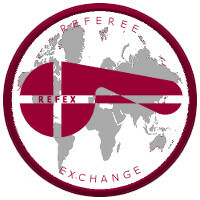 If you know of any referees who would like to come to Denmark to officiate, please let us know. Referees have a great chance to enjoy themselves socially with fellow referees from many different countries. Only certificated referees and referees at least 17 years old, are permitted to referee at Nørhalne Cup. Norway, Pakistan, Sweden, Czech Republic and Germany.